As runners, we’ve all made a commitment to good health. But to be as healthy as we can be (not to mention perform our best as athletes), we need to eat the right stuff. Real runners need real food. Our new “Real Food” series will give you some ideas. Even among the strongest-willed athletes, pizza can often be a weak spot. It’s quick, easy to eat, and tends to be most satisfying when you eat waaaaay too much of it. 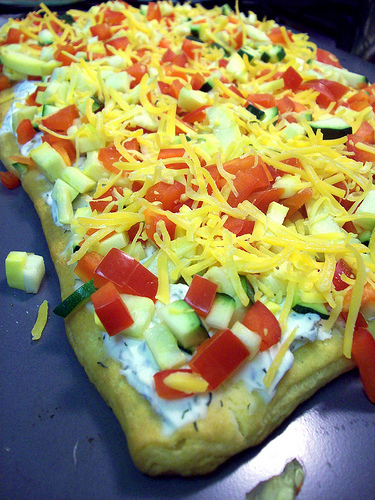 Turn the tables on that pizza craving with this easy veggie pizza recipe which you can enjoy guilt-free. Preheat oven to 375. Spread dough flat onto large baking pan to form crust. Bake about 15 minutes, or until golden brown. Allow to cool. In a bowl, mix softened cream cheese, sour cream, and dill. Spread mixture onto cooled dough. Top with veggies. Can be eaten immediately or served after a few hours in the fridge.